The Real Estate Industry is always lucrative to be part of and has constant business growth. With the growing population all over the world, demand for more residences is booming. Thus, the real estate business has no turning back. However, while there is more demand for properties, there is a large competition for realtors. Nowadays there are tons of property listing websites where people can put their homes up for sale or rent. Moreover, realtors who have their own sites are having to work hard to convince buyers to purchase the properties through them. This huge competition is what makes many realtors look for something different to promote properties on their site. Likewise, now there are several tools with advanced technology, available that can allow you to stand out among other competitions on your WordPress site. One of the latest technologies that realtors can benefit from is ‘virtual tour’ of the properties listed. If you do some research, you will see that people nowadays are looking for easier ways to engage with their interest. In order to achieve that, the world currently is focusing on using Virtual Reality (VR) as the latest technological advancement. Virtual Tour is a VR technology using which a person can experience a location remotely. This means that through a virtual tour, you will be able to visit a place virtually and experience the surrounding even without being there. For any residential or commercial property you promote on your site, you can make it more attractive and explorable through a virtual tour. A proper virtual tour will highlight all the rooms and spaces in the house. A visitor will be able to navigate on their own and move from one room to another, go to all the floors and check out every detail of the house. Plus, you will be able to include information spots where a person can click to get details, which means, you can inform the viewer of anything exclusive about specific features or areas of the house. This can be a great way to highlight the property and make it stand out among its listing on other sites. Most people believe that Virtual Tours cost a lot of money and take a lot of time and effort to create. That is why many realtors, who know about virtual tours, are not implementing them. You do not need to hire an expensive production house or camera crews. You can simply take single 360 panorama images from the center of every room of the house, and you can upload these images in the plugin. The plugin will help you to link them and turn them into a proper virtual tour. Thus, creating a virtual tour doesn’t require tons of money or experts to create. You only need to use the plugin WPVR. You will be amazed to see how brilliantly you can promote any property using a virtual tour. All these days, your website was like any other real estate websites, and you did the same hard work that every other realtor are doing. Which means, you regularly get people calling in to know more about certain properties and set appointments to visit them. Now, though this is a good thing, you are ignoring one valuable point. People calling you are probably interested. But you also have to keep in mind that the people that are calling you don’t have a visual of the structure of the property. Which means, there is still a chance that people visiting will not find the property suitable or attractive. Thus, there are many cases where you guide people on visits, but they reject it since the house didn’t seem like what they wanted. If you have virtual tours on your site, the person calling you already knows how the place looks and how it is organized. Them wanting to visit means they probably like how the property looks and they are willing to take a decision and possibly go for negotiations after the visit. As a result, you will mostly be answering calls from interested buyers and will not have to waste away hours in making people visit places without a proper interest. Through virtual tours, buyers will not need to visit several properties before finding a suitable one. They can simply explore through the houses using virtual tours. Buyers will only decide to visit places that they feel is properly built and organized according to their requirements. On real estate websites, realtors usually provide several pictures of the house. But it is not enough to create a visual image on how the house actually looks. If you include virtual tours, buyers will develop a genuine interest in properties. They will feel like they are actually taking a tour of the property and will be able to realize if this is what they are looking for. Thus people will find your listings more reliable over others. Virtual tour in real estate is still very new and many realtors yet aren’t aware of this feature. That’s where you get the advantage. If you include virtual tours for all of the properties on your site, you can easily grab the attention of buyers. Thus, people will find it more feasible to choose a property that suits them. This feature to experience the property remotely will definitely attract more people to use your website when looking for properties, over other realtors. As you can see, adding virtual tours will get you more business and is super easy to get for WordPress users. Now, let me tell you more about the plugin that will save you so much time and money. How To Add A Virtual Tour For A Real Estate Property? WordPress is the best CMS out there because it has plugins to help you implement almost anything on your website. You can customize your website in any way you like without much hassle. 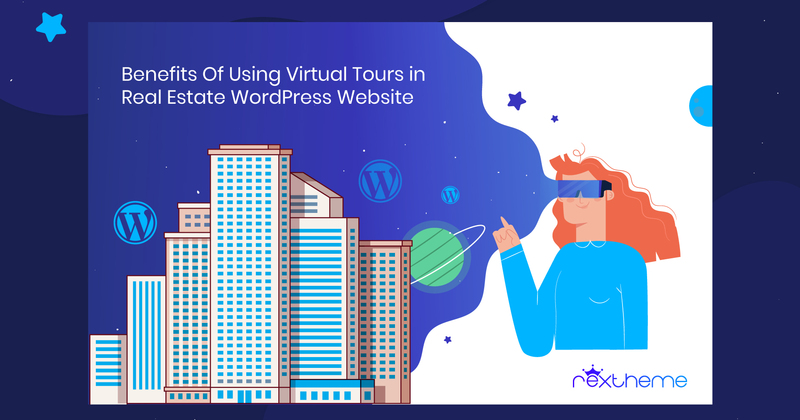 Having said that, you can also find a stunning plugin in WordPress that will make it easy for you to create virtual tours in real estate websites. WP VR is an exclusive WordPress plugin that lets you create amazing virtual tours. You simply need to provide the plugin with a 360-degree panoramic image, and this plugin will turn that image into a real-life experience. You can provide images of all the rooms of the house, and then link them to go back and forth from one another. A person experiencing a virtual tour will be able to look around, zoom in and out where required and navigate on his/her own. The plugin allows you to add information to be viewed when clicked and embed pictures or videos to be viewed on clicking on certain spots. The plugin is easy to use and has detailed tutorials. You do not need to learn any sort of coding and you do not have to be an expert to use the plugin. You can easily embed the virtual tours on your web page. The plugin generates a tour id and shortcodes for every virtual tour you create. For ordinary page editors, you can directly apply the shorcodes and the virtual tour will be embedded on your site. However, the plugin is also Gutenberg compatible. It creates a block type called ‘WP VR’. You simply need to take the tour id and provide it in the block data, and that’s it. The virtual tour will be embedded on your site. The plugin interface is self-explanatory and straightforward. However, you can always get help from the tutorials if you get stuck. If the tutorials are not enough with guidance, you can contact the support team, who are very reliable. It is only wise to use the best possible tools and make your website stand out, and more attractive. Along with optimizing your site for speed and SEO, using the right real estate theme and using all the right real estate listing plugins and widgets, virtual tours in real estate sites can be an extra boost. Hence, it’s high time you start using virtual tours for getting more genuinely interested customers. Go ahead and get WP VR now and take advantage of this amazing virtual tour creator to highlight your presence in the market, while getting a boost on your conversion from your website. This is exceptionally good! It's true that Virtual Reality has a lot of use in our current generation where Technology is in its peak potential. It makes real estate marketing at ease.